Police have arrested the man they say stabbed a 17-year-old boy to death Wednesday night -- apparently during a dispute over a piece of chicken at a family cookout. Antonio Shaw, 25, was arrested and charged with second degree murder Thursday. Meanwhile, other family members have planned a vigil Saturday for Ernest Hart, who was stabbed during the cookout in the 4600 block of Hillside Road SE just before 9 p.m. Wednesday. "My brother died on my lap, and I couldn't do nothing about it," said his sister Patricia Hart. 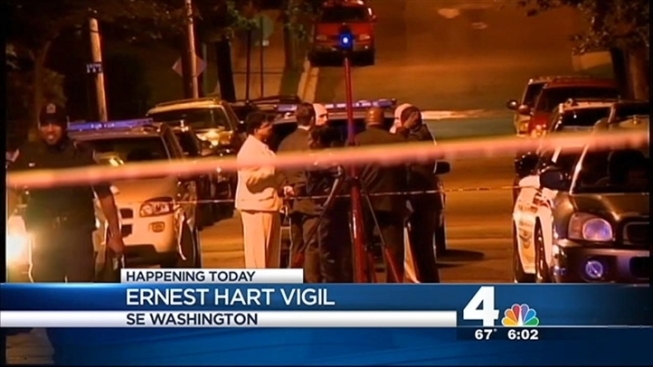 Family members said 17-year-old Ernest Hart was fatally stabbed at a cookout. His sister told News4's Pat Collins how she tried in vain to save his life. Hart was pronounced dead at an area hospital. Hart's family told NBC4's Pat Collins Shaw stabbed Hart in the neck after getting into an argument with him over a piece of chicken. "All of us turned around and all we saw was blood just dripping from my little brother, and he fell to the ground," said his brother Steven Hart. Octavais Brown, who was at the scene, said medics took a long time to arrive. "It felt like forever," she said. "I wasn't counting minutes. I was holding his pulse." She added, "I knew he was gone when they got here." According to D.C. Fire, emergency vehicles were dispatched at 9:17 p.m. A fire truck without a medic on board arrived at 9:23 p.m. A basic ambulance with medical technicians arrived at 9:28 p.m. An advanced life-support vehicle with paramedics arrived at 9:30 p.m. Hart was transported from the scene in the advanced life-support vehicle at 9:41 p.m.
Hart's sister tended to him while they waited for help. "His last words to me were, 'Tricia don't let me die,'" she said. "I applied pressure to the wound on my brother. I just didn't want him to die right then, and he did." The suspect is an acquaintance of the family. "He used to come over to my house all the time," said the victim's father, Ernest Hart Sr.